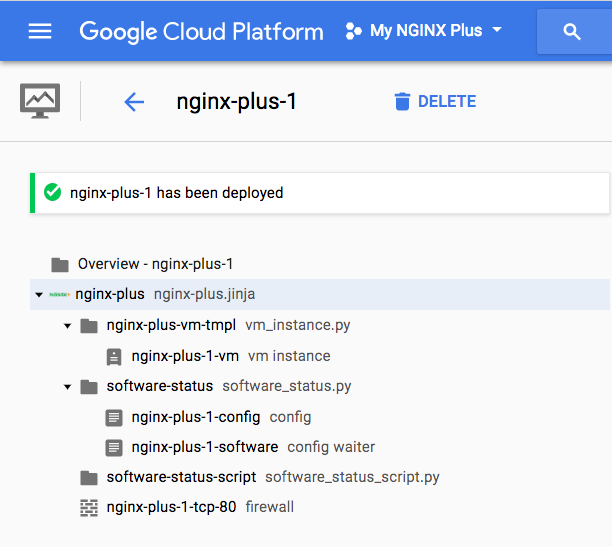 NGINX Plus, the high‑performance application delivery platform, load balancer, and web server, is available on the Google Cloud Platform as a virtual machine (VM) image. The VM image contains the latest version of NGINX Plus, optimized for use with the Google Cloud Platform Compute Engine. 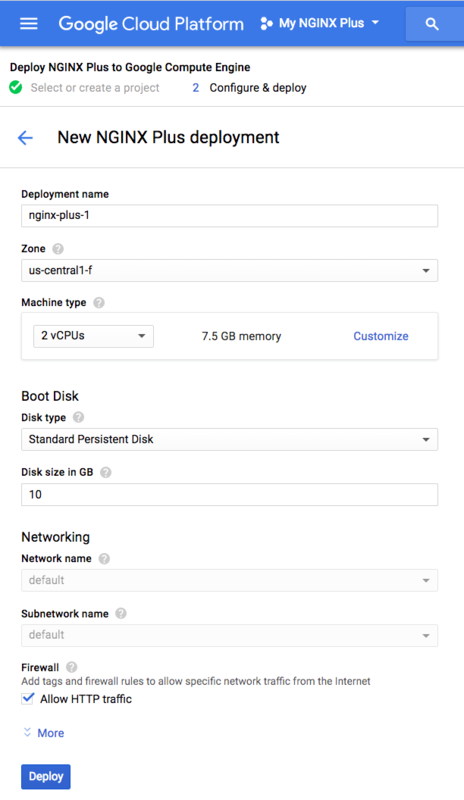 To quickly set up an NGINX Plus environment on the Google Cloud Platform, perform the following steps. Note: The Google Cloud Platform interface is under active development. Although we make every effort to provide accurate instructions, they are subject to change. Also, the exact options you see depend on whether or not you have existing projects. 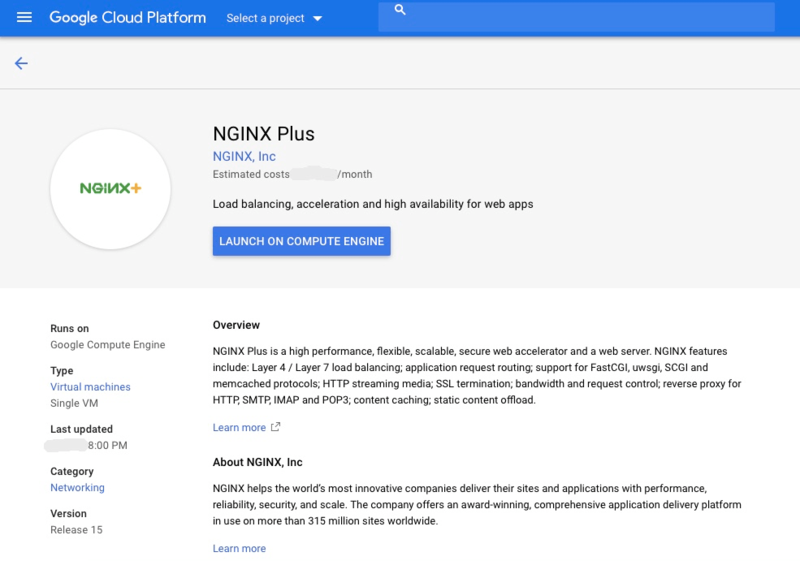 Access the NGINX Plus page in Google Marketplace and click the LAUNCH ON COMPUTE ENGINE button. The Select or create a project window opens. Enter a project name and select a value from the Organization drop‑down, then click the Create button. In the Configure & Deploy window, enter or select appropriate values for zone, machine type, and so on. Click the Deploy button. Note: In the Firewall section, be sure the Allow HTTP traffic checkbox is checked. For more information on controlling incoming traffic, see the Firewall Rules Overview in the Google Cloud Platform documentation. Click the Create button. The Google Developers Console confirms that NGINX Plus was deployed. As soon as the project deploys and the new virtual machine (VM) instance starts running, NGINX Plus starts automatically and serves a default index.html page. To verify that NGINX Plus is working properly, use a web browser to access the public DNS name of the new VM and view the page. 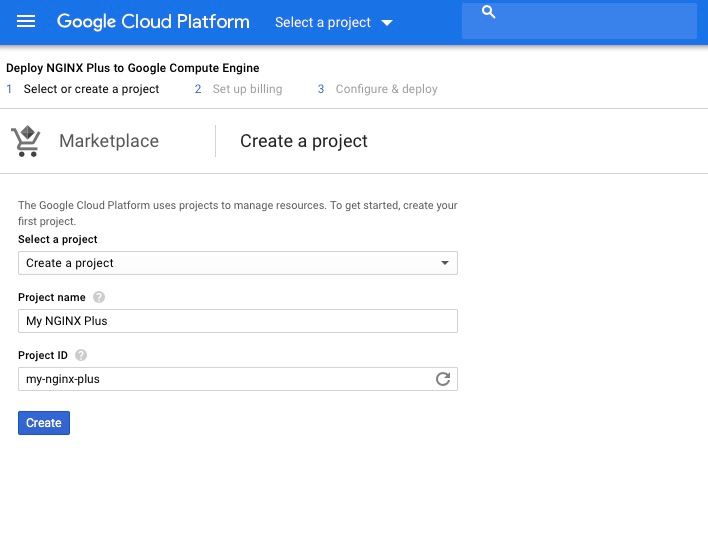 Customers who purchase an NGINX Plus VM image on the Google Cloud Platform are eligible for the Google Cloud Platform VM support provided by the NGINX, Inc. engineering team. To activate support, submit the Google Cloud Platform Support Activation form. The NGINX Plus Reference Guide is also available online on the NGINX, Inc. website.